A PSX-Scene member has ported the classic game DOOM for PS3. Since it is a homebrew application, it requires a jailbroken PS3. The game has no sound till now, but is still playable. D-PAD: Navigate menus and move/turn your character. START: Bring up or exit the menu. CROSS: Select an option from the menus. CIRCLE: Go back to the previous menu. SQUARE: Use for YES in menus and cycle to previous weapon in game. TRIANGLE: Use for NO in menus and cycle to next weapon in game. To use this, download the PKG (link later in this post) and install it using “Install package files”. Then copy a supported DOOM IWAD to the game’s directory (/dev_hdd0/game/DOOM00666/USRDIR/) OR put it on a USB drive (or on a CF/SD/MMC/MS memory card if you have an early PS3 that has the integrated card readers) under/ps3doom/. Then you just launch the game from the XMB icon and it should work. To download Doom for PS3, click here. 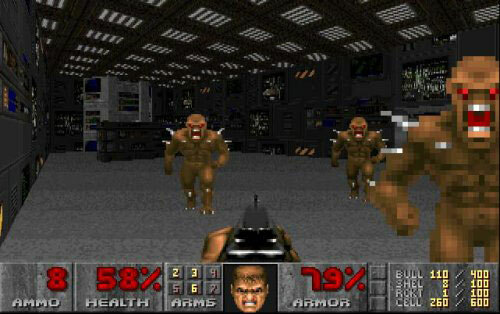 To download Doom source, click here.